However the material tested was only skimmed from the top two inches of sediments. 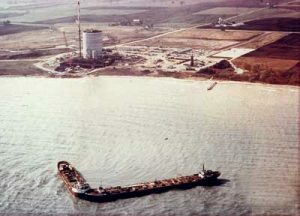 Past discharges of radionuclides (radioactive materials) from Hinkley Point would have been found in higher concentrations at deeper levels. Moreover, the tests did not look for uranium, plutonium or about 90% of other radionuclides potentially present. Not surprisingly, the tests found that the mud “poses no threat to human health or the environment,” and therefore was not classified as radioactive and not subject to international treaties prohibiting such dumping. The question is begged: If the mud poses no threat, why don’t the English dump it in their waters? —Beyond Nuclear International, Oct. 15, 2018; Natural Resources Wales, Updated Oct. 9, 2018; Wales Online, Aug. 16, 2018. Cross-country transport of the high level radioactive waste would be mostly by rail along with some highway and barge shipments. 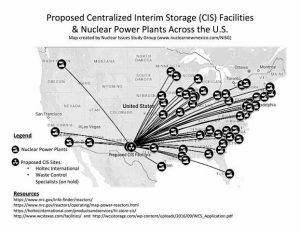 Plans for so-called Consolidated Interim Storage (CIS) of high-level radioactive waste (HLRW) in the desert Southwest are a threat to anyone living, working, or traveling near HLRW casks being transported, and that could mean most of the US population. HLRW is the most radioactive and long-lived waste left by nuclear reactors and must be containerized for over 1-million years. Two firms, Holtec International and Waste Control Specialists (WCS), have each proposed building and operating “temporary” parking lot storage facilities with enough space for more than two times the volume of all the waste (“spent”) nuclear reactor fuel currently in the United States. Holtec plans a site in Southeast New Mexico near Hobbs; WCS plans a site in Andrews County in far west Texas. Cross-country transport of the waste would be mostly by rail along with some highway and barge shipments. According to the national Nuclear Waste Policy Act, as amended, temporary CIS sites are not legally allowed unless a permanent waste repository is already operating. A June 2017 House Resolution (HR 3053) introduced by Rep. John Shimkus, R-Ill, was aimed at allowing CIS facilities to be built; it passed the House in May 2018, but is expected to die this year without a corresponding senate bill. Despite the question of legality, the Nuclear Regulatory Commission (NRC) is still considering the two CIS license applications and has been moving forward with the National Environmental Policy Act (NEPA) processes. Holtec’s NEPA scoping period ended July 30, and garnered 30,000 public comments. The NRC has announced that a Draft Environmental Impact Statement can be expected in June of 2019. WCS’s initial application process started and was paused last year due to the company’s financial issues. The NRC began a second scoping period this year. As of the mid-November deadline, it is estimated that 40,000 total comments were sent. Legal challenges opposing both Holtec’s and WCS’s plans have been filed, and pre-hearing oral arguments for Holtec are scheduled for January 23 and 24, 2019 in Albuquerque, NM. With all these events taking place, local communities in both New Mexico and Texas are actively working to inform the public and to build awareness regarding HLRW moving through their regions. Awareness has created both opposition, and support for the projects, but public opposition is much stronger than support. However, the strength of the opposition seemed to be trumped by big industry and government, especially in the current national administration. The public has spoken out with the passage of 18 resolutions opposing CIS and related transport from counties and municipalities in New Mexico and Texas. There is only one resolution from a local community in support of CIS. With the introduction of H.R. 3053 and NRC processing CIS applications, we have learned that the cancelled Yucca Mt. waste site is still being supported by some Congress and the nuclear industry. While government and industry have kept the public out of the debate as much as possible, people are becoming more aware and actively engaged in speaking out against both CIS proposals. Although there is no current public comment period, the public can always send letters to the NRC and is strongly encouraged to educate local officials about CIS—and to encourage any type of official public opposition to these temporary “Band-Aid” storage sites and the deadly transport of waste reactor fuel through your community. Experts at the US National Academies of Science settled a big question in 2005, and the president’s business friends don’t like the answer. Is there a dose of radiation so low that it is harmless? (Ionizing radiation is the alpha and beta particles, and the neutron, gamma and X-rays given off by radioactive materials in medicine, the military, industry, and reactor operations.) The NAS published its answer in its seventh edition of “Biological Effects of Ionizing Radiation” (BEIR-VII), where it emphatically said: “No.” As they had done many times before, the NAS concluded that any radiation exposure, no matter how slight, carries a risk of causing cancer or other illnesses. The public and the scientific community must fight back. There is no safe level of exposure to ionizing radiation. Even the smallest radiation exposures have cellular-level effects. The EPA website has said for years: “Based on current scientific evidence, any exposure to radiation can be harmful (or can increase the risk of cancer)… In other words, it is assumed that no radiation exposure is completely risk free.” Every US government agency that regulates radiation releases or its medical use makes the same warning — based on BEIR-VII (BEIR-VI, BEIR-V, etc.) In 1989, the National Academy’s BEIR-V quadrupled the risk of cancer from low-dose radiation exposures, and warned explicitly about “a much greater danger” of mental retardation among babies exposed in the womb to radiation.